Easy upgrade for trouble-free printing of hard composites! 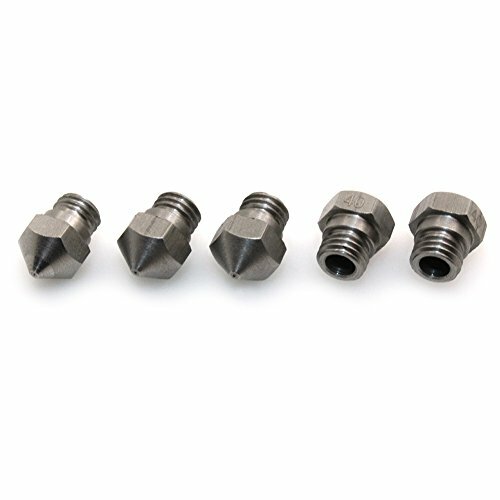 Our Plated Brass Wear Resistant Nozzles are made from brass for good thermal conductivity and plated with an extremely hard high lubricity coating. The coating increases the life of the nozzle significantly. We have yet to wear out a nozzle! With normal brass nozzles noticeable wear can occur after as little as 500g of Stainless Steel material. 1. MK8 Style (M6 Threads compatible with most Makerbot style machines including the Replicator 1, 2, 2x, 5th gen, Mini & Z18) in 0.4mm & 0.6mm diameter orifices – 1.75mm filament only. 2. MK10 Style (M7 Threads for newer Flash-Forge, Dremel & Wanhao) in 0.4mm & 0.6mm diameter orifices – 1.75mm filament only. 3. Modified MK8 RepRap Style (M6 Threads compatible with E3D (including BigBox), Hexagon (newer Lulzbot & Robo3D) & Ultimakers upgraded with an Olsson block) for 1.75mm & 2.85mm filament diameter in 0.4mm, 0.6mm & 0.8mm diameter orifices. 4. Printrbot Ubis Style (for all Printrbots W/O all metal upgrade) in 0.4mm & 0.6mm diameter orifices (ignore 0.2mm marking…long story) – 1.75mm filament only. 5. Afinia/UP!/Zortrax Style in 0.4mm & 1.75mm filament only. Larger diameters require more parameter modification, but have slightly more consistent extrusion & increased life over 0.4mm. Custom manufactured for ProtoPlant, makers of Proto-pasta in the USA by Micro Swiss. contact Proto-pasta for more information. 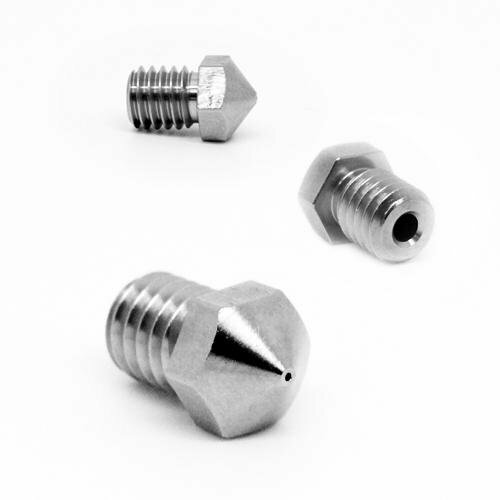 USA made Micro-Swiss Plated Brass Wear Resistant Nozzles extend nozzle life dramatically when using abrasive materials. Ultra-hard coating creates a low friction nozzle that outlasts uncoated brass. Brass base material retains thermal conductivity for unchanged thermal performance. Fit a large variety of machines, check listing name carefully to make sure it fits your printer, or get in touch with us if you are unsure.